I am back for Blogger's Challenge Friday! Today's challenge was make creations featuring animals. I just couldn't decide what to do, so I made two cards today! 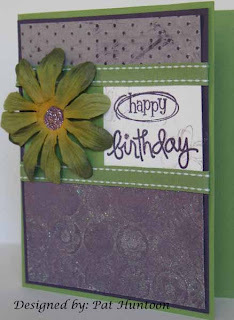 The first uses a Stampin' Up! set called Bronc Buster. The main image is layered on an Aged Parchment Background. Aged Parchment is a technique from the newest June issue of the Technique Junkie Newsletter. This was the first time I pulled out the "Build-a-Brad" set that I bought in January! As I was making these custom brads I immediately thought that I should order more...can't run out now that I used them! Stamping is a disease, I swear! They sit there for months, then I use them once, now I want more! YIKES! Hey, do you like the props for the photographs, or do you prefer them "bare bones?" I can do them either way -- let me know your opinion, if you have a minute. Make sure to check out the other Blogger's Challenge cards from the other players -- they are listed in my sidebar. Wonderful Wednesday Giveaway - See D's Sugar Shoppe! This week I have some great stamps to give away -- plus a sneak peek for the upcoming June Newsletter, too! Inque Boutique has contributed the stamps for today's give away. Stephanie Barnard, a stamp designer for Inque Boutique, is a new Technique Junkie -- watch for more stamps coming in future newsletters from this wonderful stamp company with such a fresh and current style. Let me tell you a bit about these stamps! These See D's Stamps are from the Sugar Shoppe Line. They are die cut rubber with the image pre-stamped on the back. The rubber is backed with self-adhering cling, and come with a case for easy storage. To use, simply take the stamp out of the case and place on an acrylic block . Place the paper over the cushion that is enclosed and stamp! 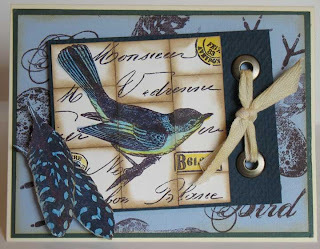 The cushion truly is a "secret weapon" for stamping great images -- it is a cushy stamping mat that gives you clear, wonderful images every time you use the stamps. The picture on the left shows how the stamps come -- but take a look at the card I made above -- it is resting on the case filled with the stamps. The compact space is great for storage, too! Inque Boutique has a list of all the stamps they offer on their site, plus a retailer finder so that you can find these stamps at a store near you. I know that you will be seeing alot of these stamps from me! Now, about the card and the sneak preview. The card above comes with the stamps. It uses a brand new technique that was filmed and contributed to the Newsletter by TJ Writer Beth Norman called Textured Watercolors. It is part of the new June issue of the Technique Junkie Newsletter, being mailed today! Check out the subscriber-only pages tomorrow -- the link to the new issue will be LIVE, and you can make some Textured Watercolor Cards of your own! Okay, want to know how these stamps and card could be yours? ANYONE can enter this give away.One entry per person, per give away, please. To enter the give away for today, simply leave a comment on this blog entry telling me that you would like to enter by 11:59pm EST on Sunday, June 1st. No other entry methods will be included in the give away. If you email me to enter, your entry will NOT be considered a valid entry. When you leave the comment, make sure to put your NAME in the comment -- if you enter your comment as "Anonymous", I cannot give you the prize! Blogger does NOT record your email address for me, so you will need to check back to find out if you have won or include your email address in your comment so that I can notify you. A good way to do this is like so: phuntoon at optonline dot net -- it will help protect your privacy! I will have a random number generator pick one number from the comments to select one winner. Each give-away is separate, so to be eligible for a specific item you must enter that day's contest on the post where it is listed. Enter today -- good luck! I have blog give aways every week -- come play! This week we are lucky to have a gorgeous stamp plate from The Stampsmith as our Wednesday giveaway. The retro feel of these stamps are wonderfully zany and just so much fun to use! The winner of the stamps today will also receive this card. 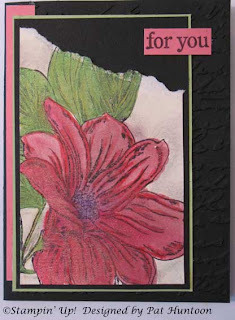 The card was stamped on smooth white cardstock, and the image was colored with colored pencils. 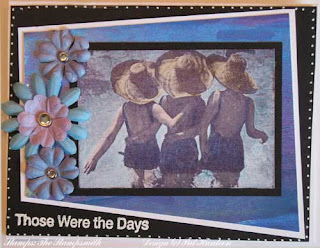 The main colorful layering piece used on this card uses the Createx Creations Technique from the April 2008 issue of the Technique Junkie Newsletter. 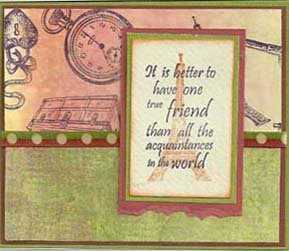 The inside of the card uses one of the phrases included on this stamp sheet: "Friends Forever." Okay, want to know how this sheet and card could be yours? ANYONE can enter this give away.One entry per person, per give away, please. To enter the give away for today, simply leave a comment on this blog entry telling me that you would like to enter by 11:59pm EST on Sunday, May 25th. No other entry methods will be included in the give away. If you email me to enter, your entry will NOT be considered a valid entry. When you leave the comment, make sure to put your NAME in the comment -- if you enter your comment as "Anonymous", I cannot give you the prize! Blogger does NOT record your email address for me, so you will need to check back to find out if you have won or include your email address in your comment so that I can notify you. A good way to do this is like so: phuntoon at optonline dot net -- it will help protect your privacy! I will have a random number generator pick one number from the comments to select one winner. Each give-away is separate, so to be eligible for a specific item you must enter that day's contest on the post where it is listed. Enter today -- good luck! I have blog give aways every week -- come play! Congratulations to Linda Aschenbach, the winner of this giveaway! 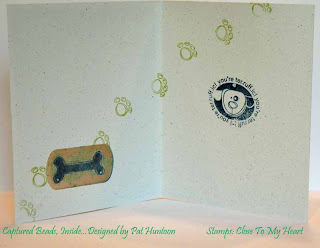 Today's Blogger's Challenge was to use the dog layout on Page 21 of the Stampin' Up! Occasions Catalog as inspiration for our creations. When I first saw the layout, I was a bit taken back -- the tear diagonally across the main panel not a look that I normally do on purpose with my artwork. Guess that's why it's called a challenge! I started my creative process with the card on the right. The beautiful stamps on this card are from the same delicious stamp sheet from Oxford Impressions that I am giving away this week (to enter the giveaway, go to THIS post). I used the Embossed Watercolor Crayon Technique from the June 2006 issue of the Technique Junkie Newsletter for coloring the bird. (A close-up of what the bird looks like from a different angle is on the left). This turned out fabulouso in real life! A couple more touches with the punches and the ribbon, and this was a pretty easy card. Okay, so now I am liking this layout! What else can I do? That is how the card on the right came to life. This uses the Penciled Twinks Technique from the February 2008 issue of the Newsletter to color the flower. These stamps are from Stampin' Up!. I admit it, I did change the layout just a touch, but I had to for balance's sake. 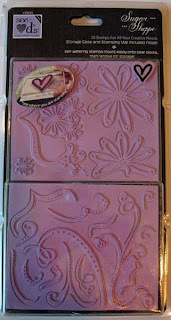 I even managed to throw some Cuttlebug embossing in the mix. I love having so many techniques at my disposal! I have produced OVER 475 step-by-step tutorials for 475 different rubber stamping techniques in the last 5-3/4 years. Without question, the Technique Junkie Newsletter has more technique tutorials than any -- ANY -- other resource on the Internet or in print. I think that is pretty cool! Sorry about the shameless self-promoting commercial -- guess I am just in a celebratory mood today! I am thrilled to have these beautiful stamps from Oxford Impressions to give away this week! This absolutely stunning sheet of stamps will knock your socks off. Deeply etched rubber with beautiful images are always a great combination.... But I have to say that every stamp on this sheet is delicious! 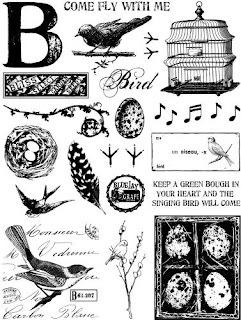 "The Bird's Nest" is an 8-1/2"x 11" rubber stamp sheet with 20 images. These stamps give fabulous impressions and offer so many possibilites for so many techniques -- I can't wait to use them with the Color Collage Technique! 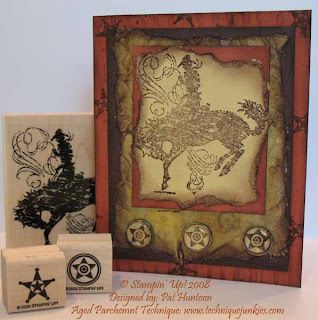 The card shown above that the winner of the giveaway will receive with their new stamp sheet uses the Aged Tiles technique from the April 2008 issue of the Technique Junkie Newsletter. I LOVE how this card turned out. 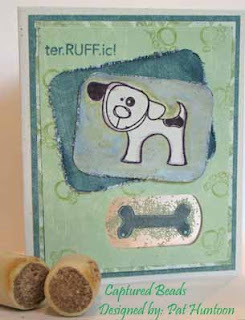 I just love this card -- it is hard for me to give it away! I think I may have to make a second just to look at! 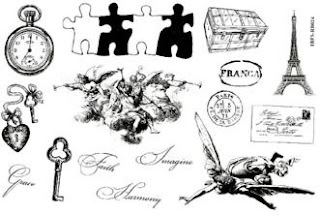 In addition to generously contributing the stamp sheet, Suzanne Melvin, Owner of Oxford Impressions, is offering Technique Junkie members 15% off the price of all unmounted rubber stamp collections. The discount applies only to Oxford Impressions rubber stamp collections - not single stamps or supplies. This offer is good from now until next Wednesday, May 22nd, so members will have 1 week to take advantage of this special offer. 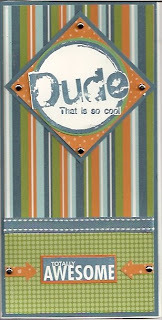 A new rubber stamp collection will be released at weeks end with a masculine theme - just in time for Father's Day! Two new collage sheets will also be available by the end of the week, so this is a good time to shop Oxford Impressions! The coupon code is: TJunkies and should be entered during the check out process. ANYONE can enter this give away. One entry per person, per give away, please. To enter the give away for today, simply leave a comment on this blog entry telling me that you would like to enter by 11:59am EST on Sunday, May 18nd. No other entry methods will be included in the give away. If you email me to enter, your entry will NOT be considered a valid entry. When you leave the comment, make sure to put your NAME in the comment -- if you enter your comment as "Anonymous", I cannot give you the prize! Blogger does NOT record your email address for me, so you will need to check back to find out if you have won or include your email address in your comment so that I can notify you. A good way to do this is like so: phuntoon at optonline dot net -- it will help protect your privacy! I will have a random number generator pick one number from the comments to select one winner. Each give-away is separate, so to be eligible for a specific item you must enter that day's contest on the post where it is listed. Enter today -- good luck! I have blog give aways every week -- come play! The winner of this give away is Barb Hendrickson! Congrats, Barb! TSSC - A bit late! Usually I post my TSSC entry on Mondays, with everyone else -- and even though this card was done, I just had to set it on the back burner so that I could finish a few other things. This is one of those weeks I call my "creative weeks" -- a full out blitz and attack on my stamps and supplies to cook up new techniques and try techniques submitted by other people. I try not to get distracted by my computer on these weeks so that I can just pop out stuff!!! I thought I better get this on here today, before the week slides away from me, though. I am eating my lunch (worried now, because I have over 400 emails waiting for me to look at -- how does it get so high in 24 hours?) so I thought I would post this. 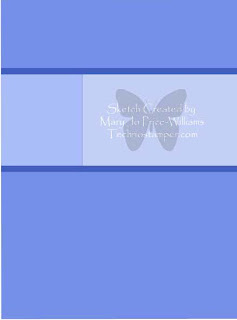 I did not do the traditional rectangle from the original sketch, found on Mary Jo Price-Williams Technostamper Blog. 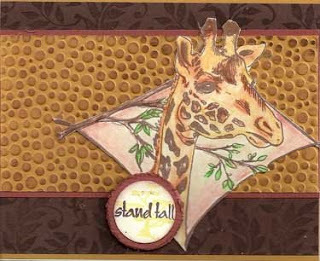 I changed it a bit, using the diamond-shaped giraffe from Wood-'n-Paper Ink as the focal point (thanks, Dee!). 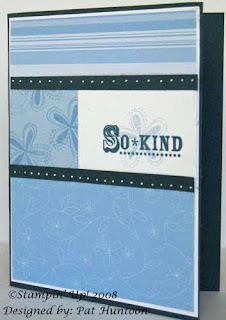 The background on the chocolate paper is from Stampendous, and the circle words and background is from The Angel Company. Congratulations to Sharon E. Johnson! 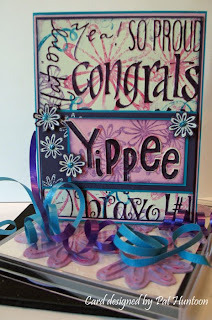 Sharon E. Johnson is the winner of the I Brake for Stamps set from Last week's Giveaway! Congrats, Sharon! I had a coupon to Michael's yesterday and it was burning a hole in my pocket. So of course, I went shopping... and out of that whole entire store, I only bought a few things: First, the butterfly image from Stampendous that is featured on these cards, and second, a really cool border punch from Martha Stewart (not featured here, it will be in another blog post soon). I also bought ribbon, because I simply cannot go to Michael's and not pick up a spool or two when they are only a dollar. I intended to use some of that ribbon for this challenge, but ended up keeping everything clean and fairly un-embellished. So, I made three cards for this challenge. Since my Mom passed, I have had a hard time making Mother's Day cards. 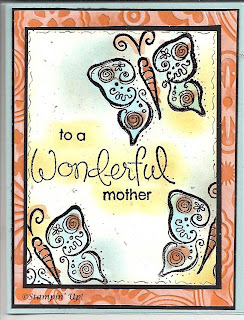 I do have a wonderful Mother-in-Law who I call "Mom", but the last three years I have given her cards that do not actually have "Happy Mother's Day" printed on them anywhere. I just couldn't do it. This year, I am emotionally free from that for some reason. I am sending her the "to MY mother" card. After being with her son for over 20 years, she is my mother. Enough blathering. I used different techniques on these cards. 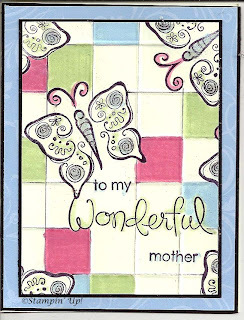 All three of them feature the butterfly stamp I bought yesterday combined with a set called "Wonderful Favorites" from Stampin' Up!.The first uses the Burnished Watercolors Technique from the August 2007 issue of the Technique Junkie Newsletter. The second uses the Modern Grid Technique from the April 2007 issue of the Newsletter. The third uses one from way back...the Pencil over Ink Technique from the February 2005 issue of the Newsletter. So why did I make three cards? Well, one will go to my MIL, one to a SIL and one to one of my sisters. I guess I just kept going on a theme yesterday. I was actually task-avoiding something else, too. I have a 4th one started, but I was called away from my studio yesterday and never made it back. It is fun to see how the same stamps can turn out so different, isn't it? I hope your Mother's Day is great! 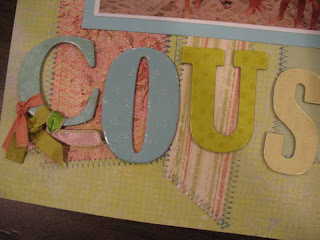 Today's Wonderful Wednesday Giveaway is a gorgeous Collage Elements Sheet from I Brake for Stamps. I absolutely adore this stamp sheet -- There are so many possibilities with the variety of stamps here! 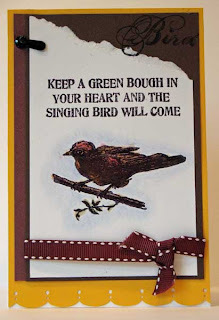 The card that will accompany the stamp sheet to the giveaway winner uses the Simple Green Spritz Background from the April 2008 issue of the Technique Junkie Newsletter. Della Warr, the owner of I Brake For Stamps, has an outstanding discount for orders placed from her website. The discount is for Technique Junkie Members only -- one you won't want to miss! Go to the Technique Junkie's Yahoo Group (you must be a subscriber to be part of the e-group) for details on the discount, or if you are a TJ member who is NOT on the e-group, email me and I will send you the offer. ANYONE can enter this give away. One entry per person, per give away, please. To enter the give away for today, simply leave a comment on this blog entry telling me that you would like to enter by 11:59am EST on Friday, May 9th. No other entry methods will be included in the give away. If you email me to enter, your entry will NOT be considered a valid entry. When you leave the comment, make sure to put your NAME in the comment -- if you enter your comment as "Anonymous", I cannot give you the prize! Blogger does NOT record your email address for me, so you will need to check back to find out if you have won or include your email address in your comment so that I can notify you. A good way to do this is like so: phuntoon at optonline dot net -- it will help protect your privacy! I will have a random number generator pick one number from the comments to select one winner. Each give-away is separate, so to be eligible for a specific item you must enter that day's contest on the post where it is listed. Enter today -- good luck! I have blog give aways every week -- come play! This week's winner was Sharon E. Johnson! Congratulations, Sharon! Today I made two cards for the Technostamper Sketch Challenge. Both cards are very simple. This is a great layout for quick and easy cards! 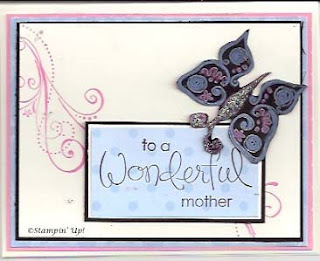 The first card, on the right, uses Stampin' Up! 's Priceless set, plus the designer paper from the hostess pack in the catalog (which, of course, I have had for almost 6 months and have not used until today!). Monochromatic cards are always in vogue, right? 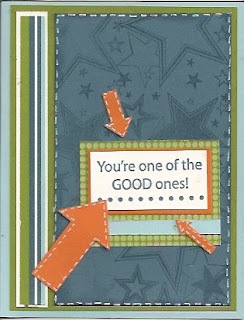 The second card, on the left, uses Studio G stamps (the $1.00 ones in Michael's clearance bins!). 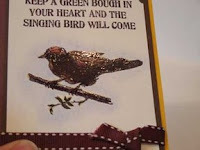 The bottom of this card uses the Glittery Cuttlebug Technique -- directions for that technique are HERE. I am still not sold on the color combo I used -- but I am sharing it anyway! The original sketch is below. Check out Mary Jo Price-William's blog to see the cards from all the players this week, and to find out how to play along, too! 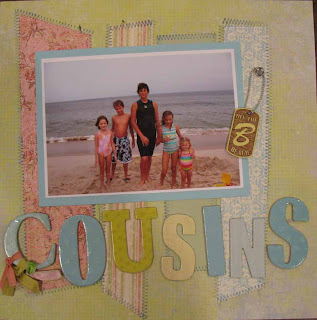 I realized today that I have not been adding Scrapbook pages to this blog. A big error on my part -- I scrapbook almost every Friday and accomplish 4 - 6 pages a week. I should be sharing them more! Here are a few -- I hope you enjoy them! Since I am working on some of the pictures I took last summer, I thought I would share some beach ideas with you. The first layout just uses a stitching stamp. I wanted the idea of the fabric stitched onto fabric for the paper pieces, so I just stamped stitching around the edges. I love the way this turned out -- it was a super-quick page that has great visual impact. Here is a close up of the stitches (oh! I stamped on the chipboard letters, too!). 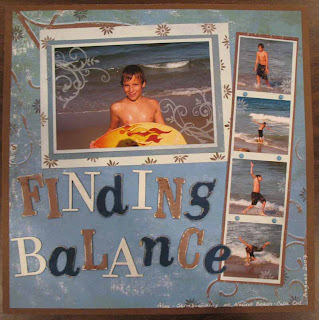 The next page uses stamping on both the pre-printed paper, the frame, and the photographs. 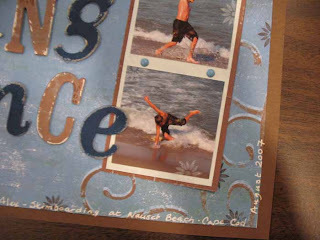 I love flourish stamps, and I love how they give movement to photographs. A little white flourish in the corners of the photos are all that were needed add more visual interest. Click on the layout to see things in more detail. I love the position I caught my son in! Notice that I journaled around the edges of the paper, too...added white to the pre-printed flourishes....and stamped little designs on the pictures and paper. That's it for today -- I hope you enjoyed these pages! Oh -- I also added more artwork to the Slide show at the bottom of this page, too. A month ago or so I was on a boy card-making jag and I thought I would share a few with you. I made some cards for a swap I was in, and I decided to use all the excess paper up to make cards for boys. I have two teen sons (ouch, it actually hurts to say that! 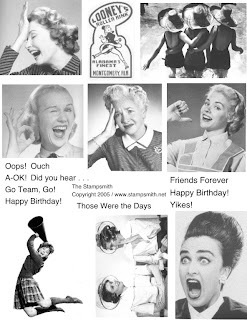 ), so I am always looking for age appropriate cards. Even though I make hundreds a month, I never seem to have the right ones for their friends, or even for them! I think these will do, though. All supplies for the cards are Stampin' Up!. I hope you enjoy these few cards from my card-fest! Don't worry, I won't make this no-technique-thing a habit! I have more, but how many can one post handle? Oh wait! There is faux stitching on the card to the right! Hey, that's a technique...Whew! thought I was slipping there!